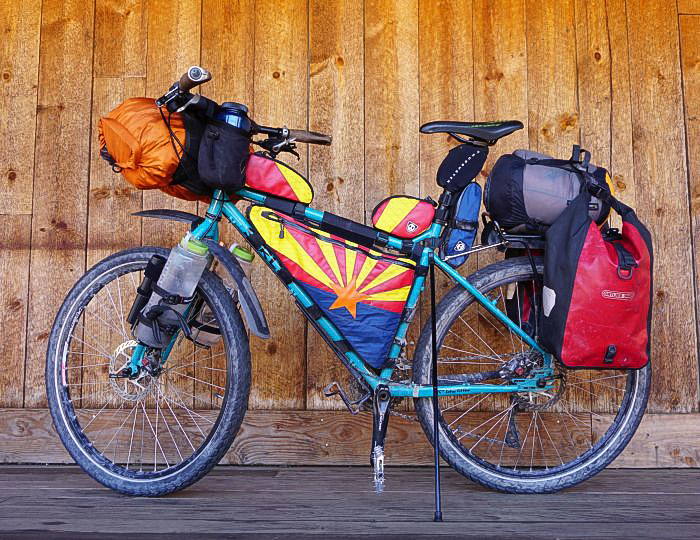 Bikepacking setup or classic Ortlieb panniers for your bicycle trip around the world? 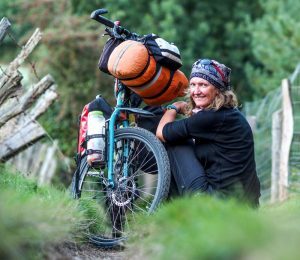 Is it possible to cycle the world with a bikepacking setup? And is it wise to do so? 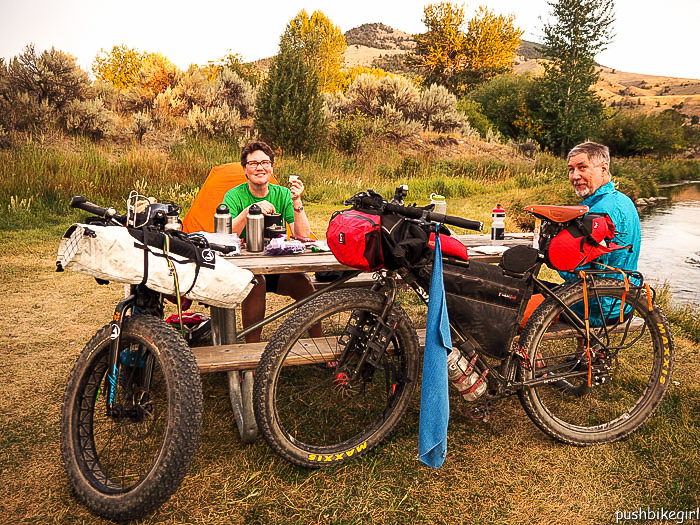 What is better – Bikepacking or the normal pannier setup from Ortlieb??? Or maybe a mix of both? 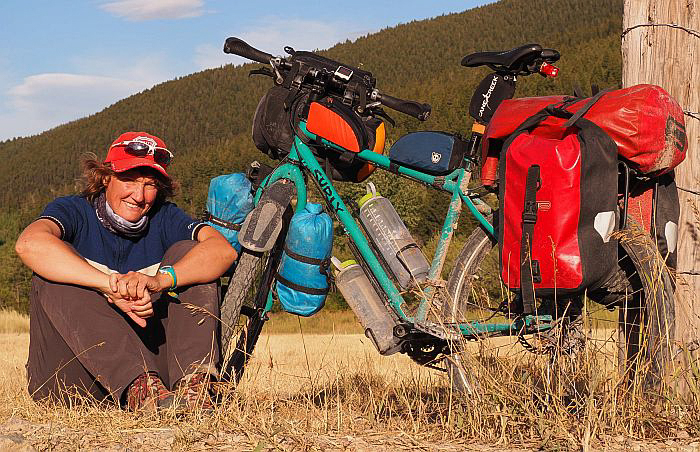 Why even consider following this new bikepacking trend for touring the world? Read on and I will tell you what my experiences are from trying different set-ups lately. 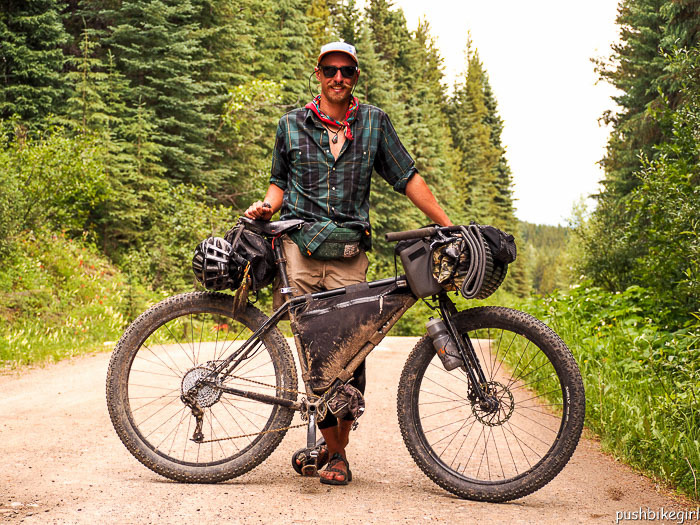 Bikepacking was created in the USA. 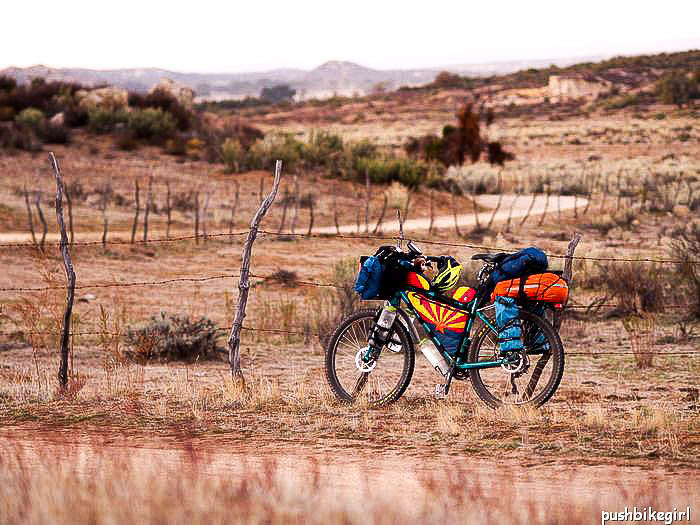 The idea is to be able to cycle off the main roads on remote trails carrying the minimal amount of gear and food needed to survive the outdoors for a few days without resupply possibilities. The minimal amount of weight gives you the opportunity to ride faster and with a lot more fun. You can also ride on almost every terrain you come across. It opens up a whole new world for trail hunters. And I love trails and off road travelling a lot. Of course, bikepacking a trail for a few weeks is a different perspective than cycling the world. 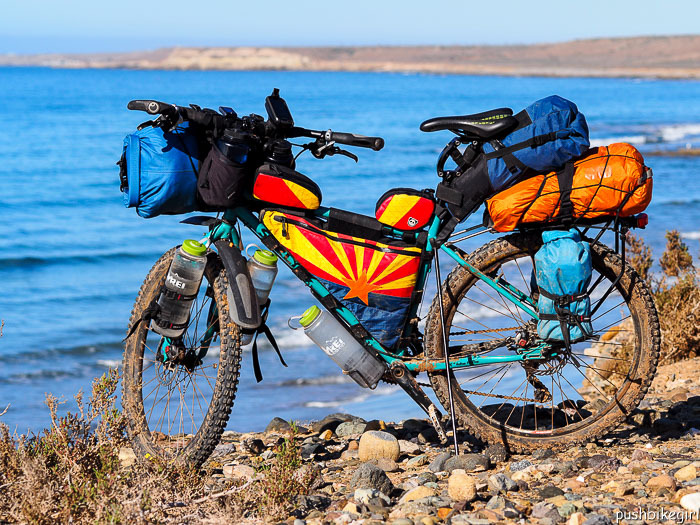 Bikepackers tend to choose ultralight gear which doesn’t last as long as the heavier sturdy materials used in traditional panniers, such as Ortlieb panniers. Ultralight gear as in tents, clothes and sleeping bags usually packs-up using a minimal amount of space. The advantage is huge. 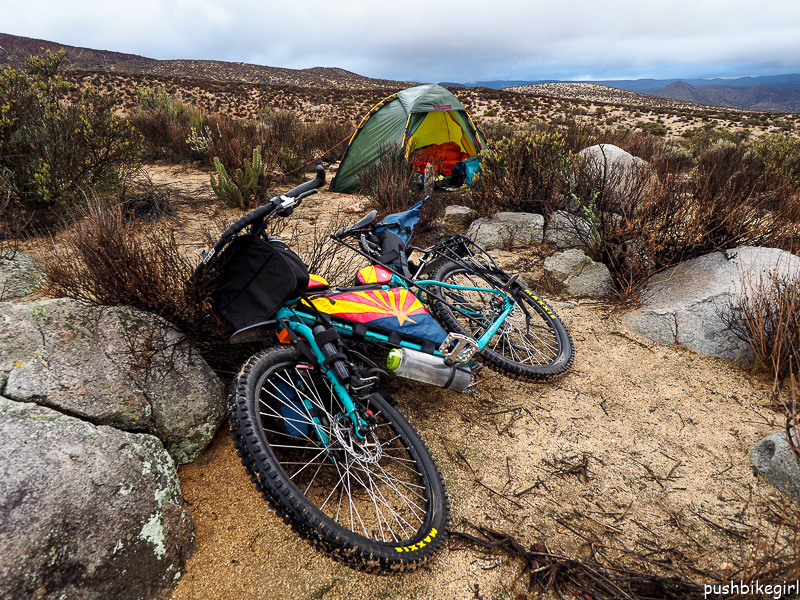 Some bikepackers also only use a Bivi sack, which is okay for a short time but not for extended travel, at least not for me. Some bikepackers are credit card travelers and stay quite often in hotels, something which is often beyond the budget of a long-term cyclist. But the ultralight gear with its shorter lifespan is not always practical for the world cyclists who is relying on their gear to hold up for years and don’t want to have to replace it as often. Additionally, bags such as frame bags are custom made to the bike and not available everywhere. All in all, I wanted to find out for myself if there is a possibility to also use the bikepacking setup for touring the world. Even with my heavier and bulkier gear and traveling solo which means not being able to share gear loads with someone else. My beloved Hilleberg tent weighs 2.2kg. My tent is heavier for the different seasons I am travelling in. I carry a 13” laptop, additional gear for cooking and things such as tools and spare parts all add up to a lot for the bikepacking bags to handle and for a solo rider to find space for. I worked on a new setup for about 8 months while riding on different terrain, including the Great Divide and Baja Divide Trails, the Kokopelli trail, and the entire Mexican country. It also included time on tarmac roads and pretty much every other kind of road and trail condition imaginable. Of course, I couldn’t always change setups to meet the current conditions nor do I have the budget of others who may then have better access to equipment testing. 1. The less weight you have the more fun the riding will be. 2. The weight with bikepacking bags is better balanced on the bike enhancing the ride especially on trails and primitive roads. 3. 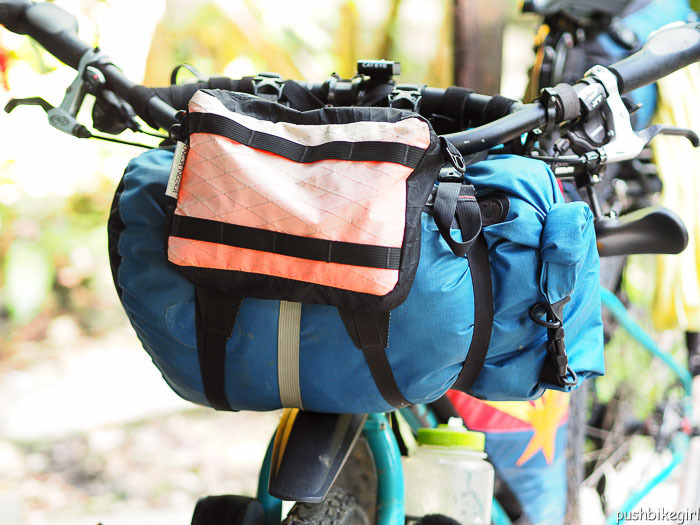 The bikepacking bags themselves weigh less than Ortlieb panniers and you are also under pressure not to carry unnecessary items because of the lack of space. It all saves a lot of weight. To be honest, this is almost everything positive I can say about a bikepacking setup for a long-term cyclist. But these arguments are not to be underestimated and that’s why I am still sticking to the system, at least in parts. As mentioned before, if you are two and you can share the big items like tent, laptop, spare parts and cooking gear, the bikepacking is definitely a great set-up for a bike trip around the world. As a solo cyclist I found it still difficult to find enough space for everything. Especially my laptop was in any way I tried to pack it always the party-pooper. 1. Food problem. Where do I put my bananas and my fresh vegetables? Yes, that’s a big problem for me and it was the biggest issue causing me to finally switch back to my small front panniers which I attached to the rear rack. I want to eat healthy while away from home for years on end. 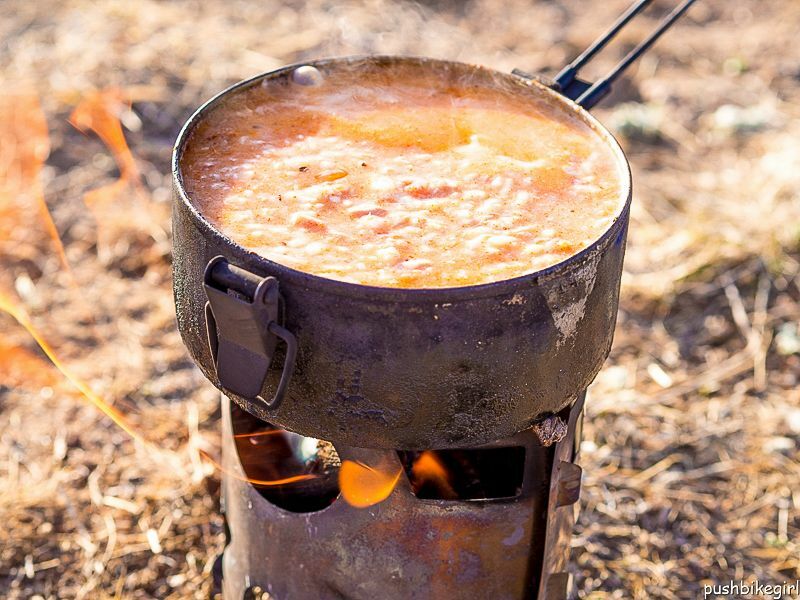 A bikepacker riding a trail for a few weeks can easily survive with rice and pasta and a tin of tuna. 2. I was shocked how fast those relatively expensive dry sacks wear out. My frame bag and saddle bag instead are sturdy and I am sure they will last for a long time. But they are not 100% waterproof and that’s a problem. The harness is strong as well. It makes a difference if you are doing one long trail and bought your gear specifically for this trail or if you are planning to have the setup for a full round the world trip, even if I know that Ortlieb panniers don’t last forever either and they have their faults too, but they definitely last longer than what I have tested lately. The wear and tear on the bags is intense bouncing over these trails especially on a touring bike with no suspension and without wider tires. Straps attaching bags move thousands of times a day and the same is true for the bags. Straps wear through and holes appear in the bags much sooner than later. 3. It is totally impractical to take bikepacking bags on and off. It is simply not a quick process. River crossings, steep slopes can become difficult for me as a solo female. Carrying your bike up to the third floor of a hotel can be a nightmare I assume even for a lot of guys. Boarding a train, a bus or putting the bike into the back of a car all become more difficult, because you can’t unclip those bags within seconds as you can with traditional touring panniers. Once the frame bag is attached it will stay on forever. Same with the saddle bag and the harness. That also means the bikepacking bags stay on the bike while you are sleeping in your tent at night. If it rains the bag interiors get wet along with anything you chose to leave in the bags overnight, at least if your bags are not 100% waterproof as most of mine are. There might also be some animals running around and chewing a hole in your bags because you might have accidentally left food in one of the bags. Or possibly curious kids who check out your bags while you are sleeping. There is a huge difference if you are always on a trail which is far away from civilization or if you pitch your tent somewhere close to a town. I personally like to have all my belongings in my tent at night, with bikepacking bags that means you always have to empty the frame bag, the saddle bag and the small top tube bags item by item with everything loose in the tent through the night and then load it all back into the individual bags in the morning. Pretty annoying and time consuming. With the Ortlieb panniers it is an easy unclipping in a second and you can have your gear with you while the tent is closed for the night. Everything simply stays in your panniers safely stowed in the vestibule. 4. 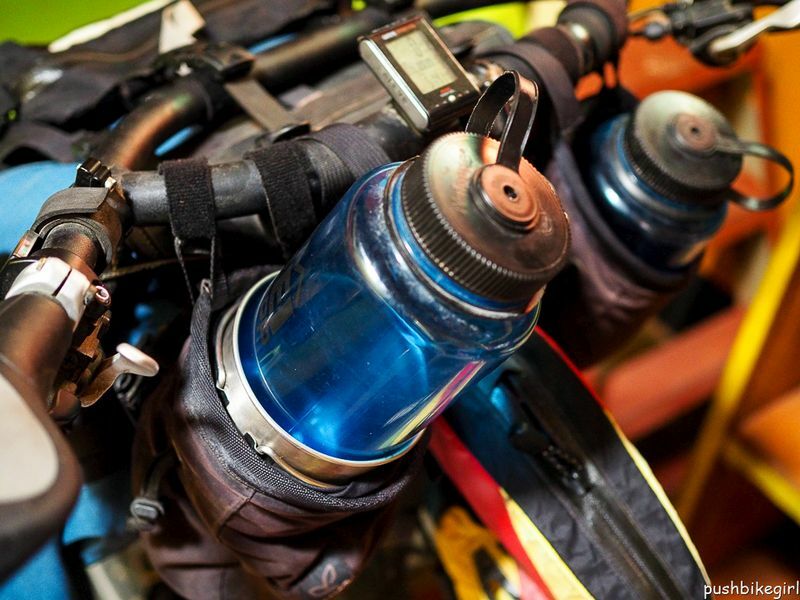 If you like to ride your bike through town without any of your gear packed on your bike, the harness with its long straps are always in the way. Same with the cages where you either attach a bag or like I do attach a water bottle. 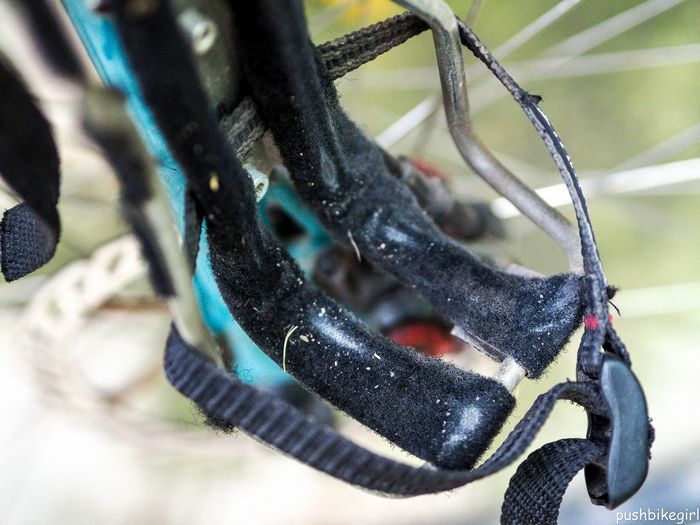 You have to attach those straps somewhere around your frame or click them in before you start riding. That is also the case when you just push the bike for a few meters when you start loading your bike in the morning. The straps always twist their way into the disc brakes or spokes. At least it does it with mine. It is not a big thing, but it has to be done. 5. Packing and unpacking takes too long with the amount of gear a world cyclist is normally carrying – even if I have reduced my gear a lot. Packing up is a tricky process to get it all in with a bikepacking set-up packed tight and if you need something during the day, it might take a bit to get it. In most cases, it is not simply opening and digging through a pannier for what you are looking for, no it might be at the far end of a dry sack and you have to pull everything out to get to what you need. I know a clever packing system would avoid this, but in some cases, I couldn’t avoid it. I tried it in hundred different ways. 6. People don’t seem to see that you are touring for an extended time. This might seem a weird reason to mention here but I still want to be identified as a world cyclist not as a short term bikepacker. And I don’t mean this in a negative way, but it is a different way of life. 7. Seasonal issues should be mentioned also. Where do I store my winter gear? But I already left my winter gear with someone in the US, so I have this issue anyway and also found it a bit silly to carry winter gear through a piping hot climate where I am right now. 8. The frame bag can damage the paint on your frame. Here are the different trials I worked on for about 8 months checking out the possibilities bikepacking offers. It all started with an accident in the US, I was hit by a car and needed a new bike. So it was time to try to switch over to bikepacking. This first picture shows my setup for the Great Divide MTB Route. Harness in the front with my sleeping bag attached in a waterproof stuff sack. The front fork with cages and 2 bags and my front small panniers attached to the rear rack. 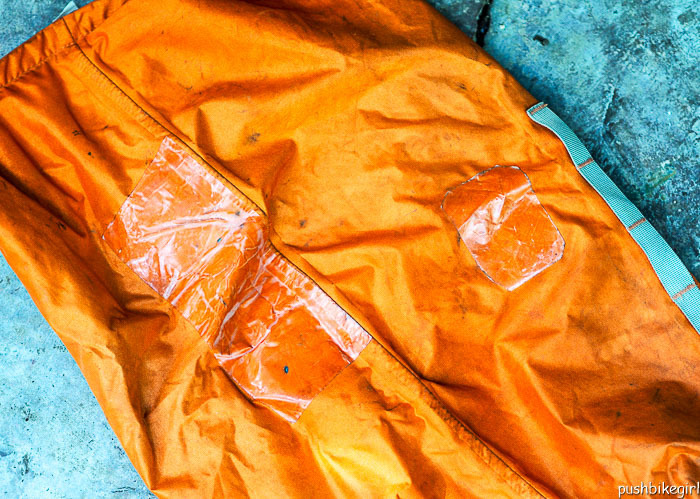 Plus a waterproof Ortlieb dry sack, which is far heavier than other dry sacks but last far longer. It worked totally fine for me and for the technically easy Great Divide trail it was perfect, but I wanted to get rid of the panniers just for the sake of it. So my next step was that I received new bikepacking gear from Rogue Panda. And I was finally able to eliminate the panniers. But my first trial didn’t work out well. I wasn’t able to pack my gear the way I needed it. 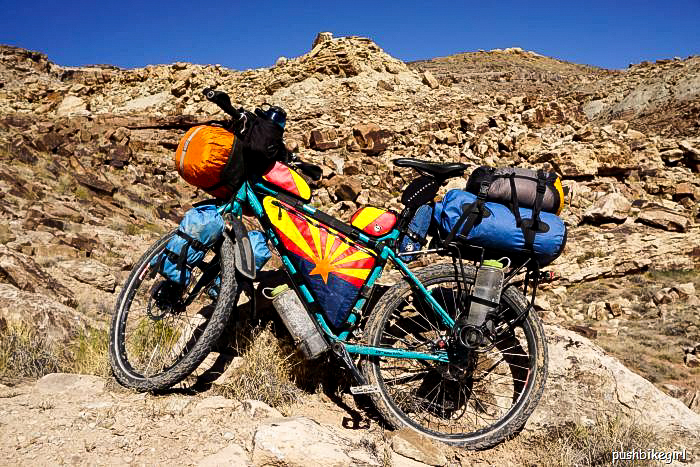 There was no easy way, to have access to the blue dry sack on my rear rack, because my sleeping bag was on top of it. It was just too complicated. I had my laptop, which was always the biggest problem in the blue bag. The next trial was using the panniers again, but it didn’t work well because the sleeping bag stuff sack was too slippery to get it properly attached to the rack without using tons of straps to attach it. And I was back using the panniers which I so much wanted to avoid. Finally, I started using a seat bag for the Baja Divide Trail in Mexico. And a rear dry sack which I attached with one strong strap that clips and a small cargo net to give it more stability. I had my laptop in my orange bag with my tent. Each time it was wet, I had to wait to pack up because a laptop and a wet tent in the same bag isn’t very healthy for a computer. Sometimes I put the laptop in the front dry sack which is attached to the harness, but it is too bulky and always presses the mudguard to the tire. This setup wasn’t perfect either. The Thudbuster (the suspension seat post) couldn’t work properly any longer and therefore I had back pain. I was also tired of the laptop packing problem. Finally, I got my panniers sent again and the set-up I am using at the moment might be the final setup for the rest of my tour, but I am not yet 100% convinced about it. Now I have too much space and too much weight again, but that also means I can easily carry more clothing with this setup in colder winter conditions which I will surely encounter in the future. My laptop is now in one pannier. My tent in the other pannier. If it rains and the tent is wet I can pull out an extra dry sack for my tent and attach it to the rear rack. In the front is my sleeping bag, mosquito net and pad. Clothes and my camera lenses are in my seat bag. Frame bag has random stuff which is not so important when it gets wet or stolen. It also contains my poles for the tent. The rest is somewhere in the panniers. The set-up feels comfortable to cycle and I can still carry 6.5 liters of water and finally some fresh and healthy food again. My laptop is in a safe and dry place. But I haven’t done any serious trails with this set-up lately, so I am still considering switching back to a full bikepacking set-up when I will get to the next trails. All in all, I guess there is no perfect solution. 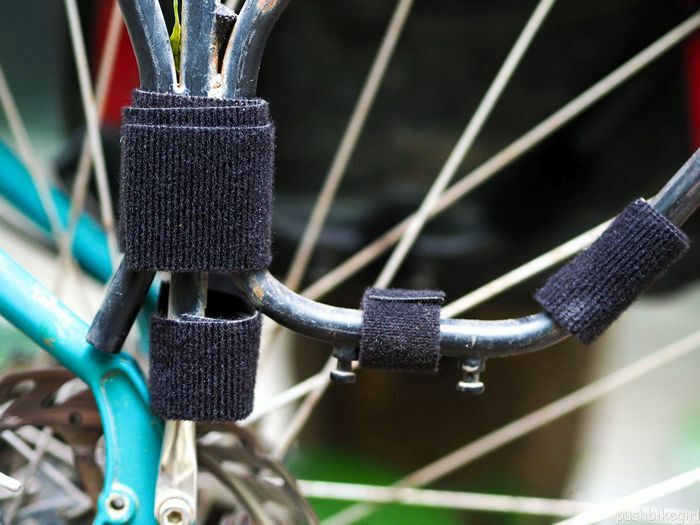 To avoid rattling I am using Velcro ( soft peel and stick side) which I have attached to almost every surface of the bike especially the rear rack. It helps a lot and I can definitely recommend using it. I found it handy to have loops sewn to the dry sack, it gives a more stable attachment to the harness. 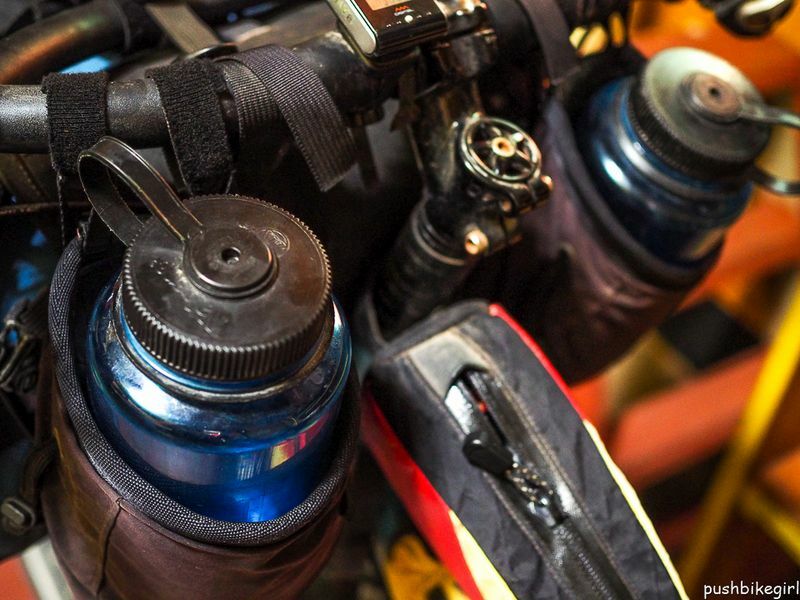 I also like my chalk bags attached as bottle or food holders. In one of the chalk bags I carry my cup and on top of it my water bottle. Keep in mind that we are all different and have different needs and preferences. What works for me might not work for anyone else. If you have any questions feel free to ask. If you like to share your personal experiences you are more than welcome to do so. das sind ja mal wieder super geniale Tipps. Ich fand die Idee mit den Chalk-Bags klasse, das werde ich bei meiner nächsten Tour auch verwenden. Auch die Idee mit dem Velcro zur Geräuschminderung ist super. Great write up. Being concerned with securing my Ortleb saddle bags to the rack for trail riding I spoke to Ortleb. The recommendation to use double clips on both top and bottom is a great idea. For approx. $17 this should secure the bags while still allowing a quick release. Good write-up, thanks. I am jus about to set off again with Ortlieb bike packing bags instead of panniers- they are completely waterproof, I already used the front bar-bag for 2 months. Your laptop seems a pain! I didn’t want to have the weight so brought an iPad instead which nicely fits into my Ortlieb bar-bag which fits nicely over the bike packing front bag. A bit slower to use and type on but can do most things your laptop can do without the packing hassle. E.g. I used it to write some of my assignments for a teacher training course without difficulty. Thanks Graham! Yes, Ortlieb seems to be 100% waterproof! I know the laptop is a problem. Working with pictures and blogging and being on the road for a long time it is almost my best friend…I wish it would be a bit smaller, than I could put the laptop in the seat bag. But those laptops are expensive! Thanks for the idea – but no I don’t like to use a backpack. I used a small backpack for my 14″ laptop for part of my tour with the idea to keep it safe. Got onto black ice on Vancouver Island, hole in the laptop and corner of the laptop broken, but still working. Just like you I changed my touring bike for my mtb and bikepacking set-up 8 months ago, to go and ride off-road trails in Southern Europe. I share the same experiences as you with this set-up. It’s not easy to pack your stuff away in all this little bags, hard to remove the bags when you want to go on a day ride, they’re not fully waterproof, the dry bag at the handle bar starts sagging after a longer period and there’s simply not enough space to carry food for a few days. So, I really, really loved this set-up when I was doing shorter 3 or 4 week trips because it allowed my to ride brilliant trails, camp at amazing spots, etc… but I’m a bit fed up with the set-up for this longer period. I’ve cut a garbage open to hang over the bike to keep the bags more or less dry at night. My laptop is in a small backpack, together with a baguette and toilet paper (light & bulky stuff). It’s not heavy, but it’s hot and after all these months, my back is suffering from it. As a couple it might be doable for a ‘world trip’, but still you can’t ignore the fact these bags won’t last as long as the Ortliebs. In 2 weeks I’ll be home and am looking forward to be reunited with my touring bike and Ortliebs. Yes the bike packing bags are not as convenient, and I also have the problem with carrying food. However my Specialized Sequoia has handy lugs on the front forks which can take a gorilla cage which holds a dry bag just perfect size for stove and some food for a couple of days. great writeup, my experience has been very much like yours. 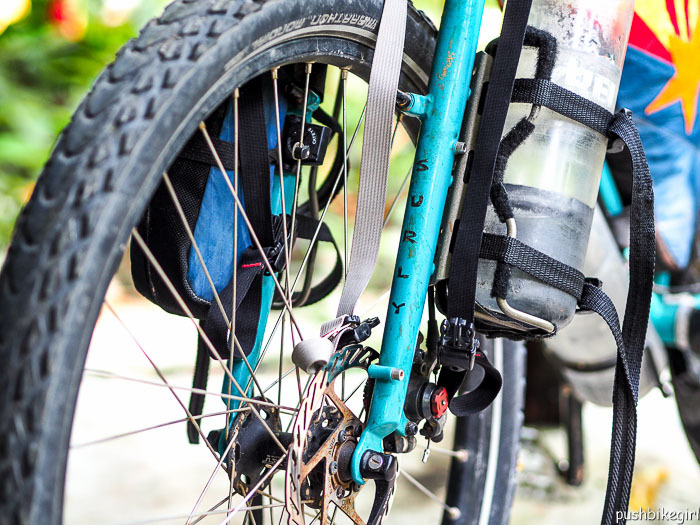 I just sent in the fork on my steel touring bike to have salsa anything cage braze-ons added so i can setup my next road tour with bikepacking bags instead of panniers. Thanks for the article. I agree the Ortlieb are best overall option. Easy on and off, waterproof and sturdy a hard combination to fault. I tried other systems but the Ortlief panniers are rock solid. Hallo Heike es ist fast nicht zubegreifen wo Du die Kraft her nimmst, seher gute Fotos. Thanks so much for taking the time to write this up, I found the information super-useful. I guess I should also call myself a world cyclist after more than 2 years on the road. I am currently riding with a full pannier setup, but the longer I ride, the more I am attracted to remote trails and have been thinking of switching setups for the last few months. I think I’ll end up with some kind of hybrid system like you eventually. Hi Dosh, thanks for your great feedback! And yes I think a hybrid system is a good choice for a solo cyclist. The youtube https://www.youtube.com/watch?v=OjtHuHv_8OQ&t=44s video shows you my first trial…..I will come up with more in a few months…. Hello! I have made only short bike tours (from 4 days to 5 weeks), but they make about 11 000 km all together. I have a traditional 4 pannier setup. Lately I have wondered why people use so much money on less durable bikepacking gear and bikes that are not fit for touring. If I would bicycle to remote places and prefered footpaths over bad quality roads, I’d simply go and by one of those city bike front racks (like the expencive Surly 24-pack rack) and a strong Ortlieb dry sac. 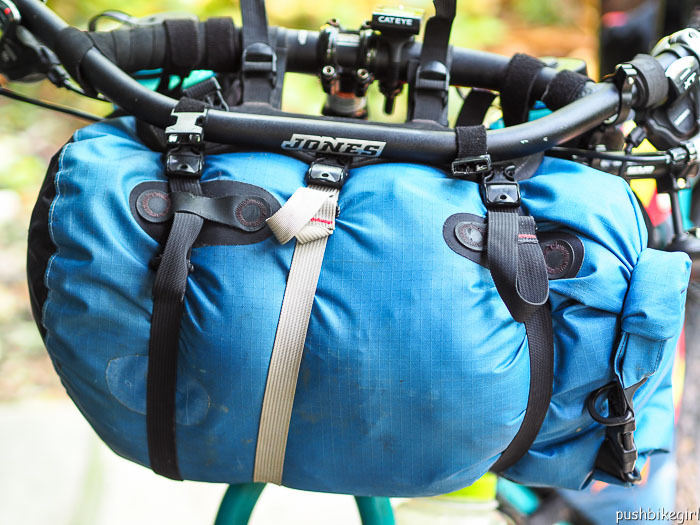 I believe that a setup of traditional rear panniers, dry sacs on both front and rear racks and an optional frame bag would work for both bikepacking and traditional touring. Good luck on your trip! My tours are down to one week per year until the kids get older. Hello again! An important thing about the weight issue: “Cheap, lightweight, durable? Pick any two.” This was said by a bike designer called Bontrager. There is nothing stopping a bike tourist from buying a 27.5 or 29″ bike with 1*11 gearing and disc brakes and fancy bikepacking bags. Its just the risk of something going wrong and not finding spares that gets bigger. In my opinion a bike tourist should give a good head start to all new things in the bike industry to make shure they actually work. Five or ten years from now I might just go and by me a waterproof, durable, handy, tested bike packing bag that does not damage the frame or the cables. Hi Heike. I’m not really that pessimistic. Bikepacking seems like a lot of fun and more social than traditional touring. I dont have backround in bike sports so I see my self as a bit of an outsider in this bikepacking trend. More into wristwatch, paper map and freedom to go anywhere I please. I’m a light packer and I like the combination of four half empty panniers, low centre of gravity and the stable ride of a bicycle with touring geometry. And the fact that I can buy a bag full of food and not worry will it fit or not. Hi again, as mentioned I am also not so convinced about bikepacking. Why do you see bikepacking to be more social? Mountain bikers practice together. A weekend bikepacking trip is easy to organice. Randonneuring is also done in groups, because it is a competition. 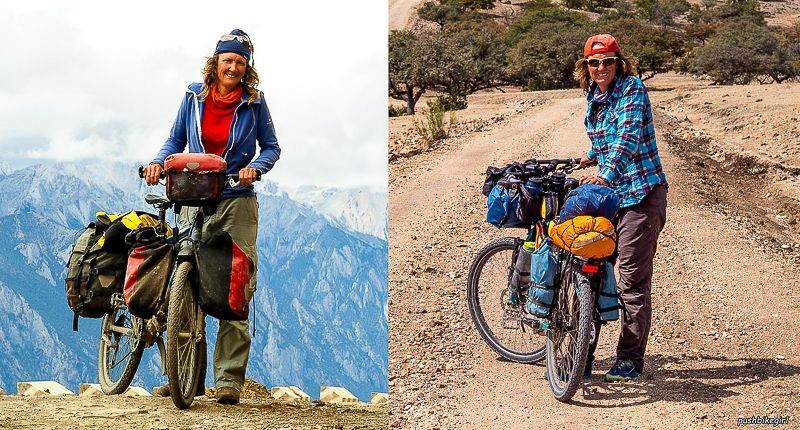 They use bikepacking bags to keep their bikes lighweight and aerodynamic. In the other hand its easier to meet people on the way when you are not in the middle of the woods or trying to bicycle 200 km per day. Thanks for a great comparison. I have used Ortlieb panniers a lot for many years. I like the strength and waterproofness of Ortlieb panniers. For my last two trips in Spain I have used bikepacking setup. My Surly ECR is fully equipped with Revelate Designs bikepacking bags. I fully agree that it is a hassle to unpack the bike at night and repack everything in the morning. Right now I run a semi setup with small Ortlieb panniers on my rear rack. In that way I can load up with extra food and water if needed. I wish you a happy New biking Year 2018. Und 1000 Dank für die vielen guten praxiserprobten Tipps. Eine Frage hab ich noch: wie schaffst du es, dass die Dinger dauerhaft halten? Erstmal sitzen die HR Taschen bombenfest, aber wenn ich die QMR Haken abziehe, rupft es das Velcro jedesmal ein bisschen mehr wieder runter. Hab selbstklebendes und normales mit Sekundenkleber probiert. Vielleicht ein spezieller Kleber? Hallo Markus, freut mich von Dir zu lesen. Frohes neues auch fuer Dich…. Ich würde sagen, da hast Du das falsche Velcro. Ich habe meins in den USA gekauft. Die halten so extrem genial, dass man sie kaum noch wieder vom Rahmen bekommt. Da verschiebt sich bei mir gar nichts. Kein extra Kleber, nix. Danke fuer Dein dry sack Tipp. P.S. von wegen haltbareren Drybags sieht dir mal die Exped Endura Fold Drybags an. Günstig sind die nicht und auch ein bisschen schwerer, aber erheblich haltbarer und mit den Daisy Chains gleich besser zu fixieren. My anti-ratling and anti-sanding solution for the bags is to use aquarium hose. You can buy it in either transparant, black or green, and in many diameters from 8 to 24 mm or so. They are already ant-slip by the nature of their material. Just cut a piece trough the full length and slip it on the racktube. Or cut it all the length at a 45 degree angle and wrap it around the racktube. Longer hoses will stay in position just this way. Shorter hoses can be extra fastened by either a cabletie and/or with ie Pattex Multi glue (use a thick glue that fills the spacings). You can also consider to slip two hoses (of two diameters) over each other. Thanks Wilfried 🙂 Good ideas !!! I put my laptop in a softsleeve and then in a dedicated drybag. Works oke for protection except ofcourse when really being hit hard. You could even try to find a second softsleeve to put the first sleeve in. Trick is ofcourse that a laptop never should get wet nor bended. Although bending is by far not really critical since all of its parts are small and not very sturdy themselfs. I always put it in a pannier and always directly and flat to the inside, so to the sturdy bagplate. I think it then as maximum protection at all sides. Alternativ is to wrap the tent or sleepingbag around it so it has an extra softshell. The drybag always keeps the laptop dry and that is the most important aspect. yes true, but you know what after being on the road for a long time you actually figure out that you need less and less for your comfort – so at the end it was really mostly about the healthy food why I switched back to the hybrid set-up. Thanks, Heike, great how you looked at many evaluation criteria, and gave various suggestions. 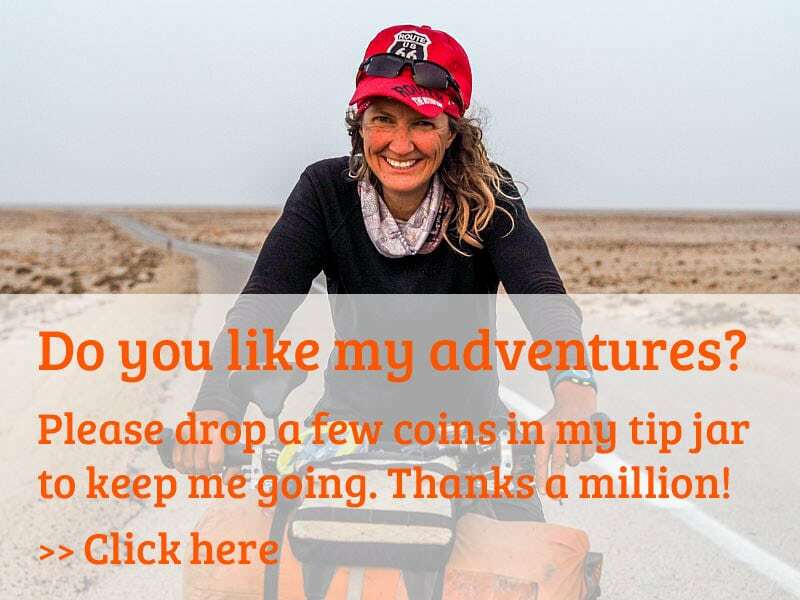 After reading your comparison, I will use a road bike with bikepacking, as here the costs of food and accommodation are low, a cooked meal for 1$, a room & shower for 3-6$, ATM card travelling ;-). Several tours, up to 3 weeks each, we did on a tandem with a Bob trailer, excellent riding with the Bob. PS: hope to hear soon of new adventures! PS2: Publish a book or several, with your great pictures and thoughts. glad you got some info out of it. Enjoy your ride….and the awesome food and friendly people. Selling books is not easy – there is a lot of work involved – but hardly any money to earn. Thule Pack’n Pedal Sport Racks. Strap them on at your “transportation” days. Take them off at your mtb exploration daytrips. Have you ever used or seen being used a Carradice Camper Longflap Saddlebag while on tour? Hi Friar, I know that a lot of people are using this Saddlebag but I have never seen it myself. 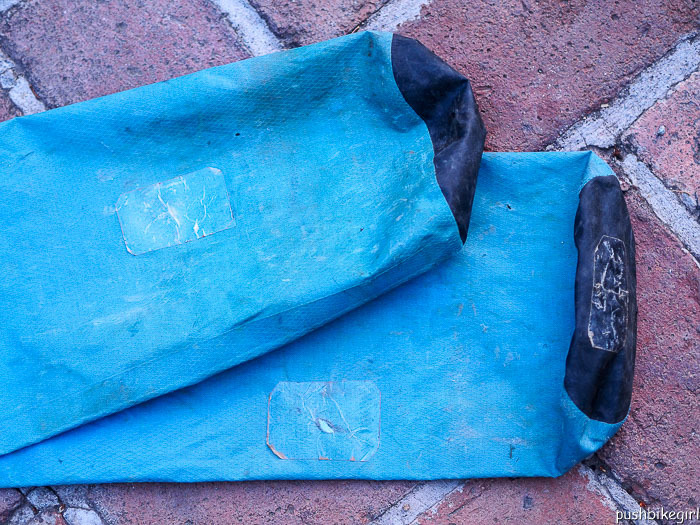 I wanted a 20 liter seat post bag, you know the long bag that swings back and forth as you pedal. I quickly found out that no one makes them…then I found out about Saddlebags, as I looked into them I discovered Carradice Camper Longflap Saddlebags at 24 liters this was what I’d been looking for…and with their Bagman Expedition Support Rack…my new Carradice was a very stable bag for carrying my gear…. I highly recommend this bag. P.S. I also have a Rogue Panda frame bag I love it also, mine is their Roller top frame bag… let’s me add a few more things. Thank you for publishing your thoughts and results of your many attempts to find your perfect luggage carrying set up. I have found that the least worst combination is like you have also discovered – small Ortlieb front panniers but on the rear, small ortlieb dry sack on top of rack between panniers or small rack pack bag 24l and on the front Ortlieb heavy duty PS490 13 or 22 litre dry bags strapped to Salsa anything racks or similar. I do have a front Ortlieb PS21 bike packing bag but don’t like it so much as I don’t like weight on the handlebars 1) for making front top heavy high centre of gravity affecting handling and control and 2) interfering with brake and gear cables. It perfectly easy to carry all your stuff where space for food and water. Also tyres make a big difference. Road touring I put narrower 1.35″ tyres on, but touring longer and off road trails I put 2.4″ inch tyres on which gives more suspension as I too have a Surly Troll with solid front fork. I did think of fitting a front suspension fork but the extra weight was too much and also if it broke would have no benefit of it and the negative of the extra weight. I would like a Surly ECR with 29×3″ tyres. THanks Alex for sharing your thoughts! The problem with wider tires is that they usually don’t last as long as a Schwalbe Mondial. Travelling in remote areas or the undeveloped world it is difficult to replace them. BUt I agree it is nice to get some extra comfort through wider tires….!!! Thanks for a great read. Really enjoyed walk through some of the trails and trails you navigated looking for that perfect setup. Hi Heike, thank you for sharing your valuable experiences. I’m 59 years old and in early 2018 I started biking. I made a trip alone, by trails and dirt roads with a lot of ascent and gravel. I used a pair of MSX Mainstrain SL55CX pannier and I really liked the quality. In August I made a new 700-km trip for the same type of terrain, but this time I used a watertight bag in the rack and carried the tent tied to the handlebars. In the summer of 2019 I intend to travel from France to northern Norway and I am in doubt about using the new MSX Mainstrain saddle bag for bikepacking or my traditional panniers. I also have a Ortlieb handlebars but they seem fragile to me. What would you advise me? What about the quality of the MSX Mainstrain brand what do you think? Thank you, Fernando Morado, Brazil. Hi Fernando, sorry but I never used the MSX – neither the panniers nor the bikepacking bags. 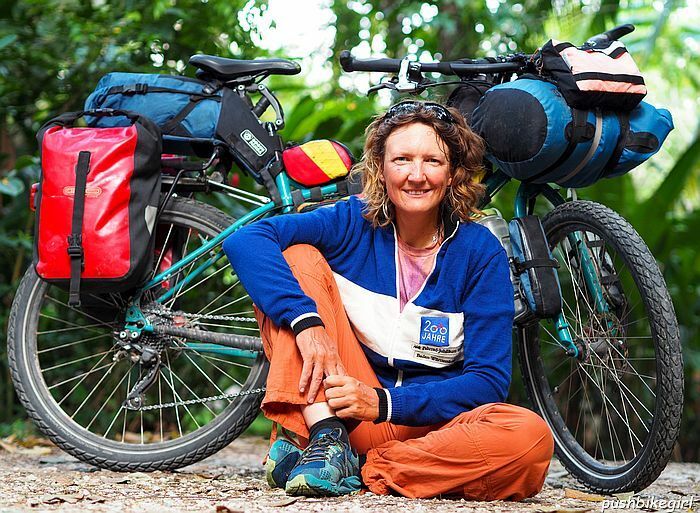 Hi Heike, I decided to write you here with a few questions about bike packing. When I do it here, everyone else can benefit from it as well. 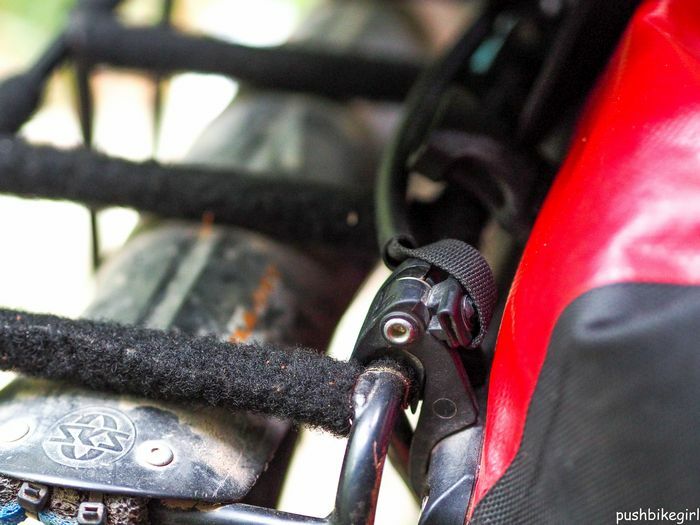 1) To me it seems there are a lot of straps involved in the bike pack set up. Is that so? And is this not a little bit more effort to loosen things, especially a camera bag when you go into a shop to buy groceries? 2) It seems that all this seperate items hangs together with straps. When you want to get your sleeping bag, you need to unloosen your tent as well. Now, this is of course not an issue, as those come off together at the same time when setting up camp, but what with when you need, for example, a charger? 1: yes far more straps than with panniers. But my camera bag is actually really handy because I can use it as a backpack. I attach it with two female male clip snap and a long strap all around my front dry sack. Tight and easy to clip and unclip. I now carry tent and sleeping bag in one dry sack. But I put my sleeping bag in an extra dry sack inside of the bigger dry sack – to keep it dry just in case my tent is wet. Bikepacking takes a bit of time to get used to the way you pack. You need to develop a system where you have access to all the important items within a short time. It takes a bit to figure it out. 3: good question….I would say it can be done without it. Great to read this analysis, I kept wondering how bikepacking worked and was curious to know the differences. Having read your piece I am certainly convinced that bikepacking is not for me. I ride with Janneke so we share the tent for example but the panniers are full even though we’ve downsized so much gear. Maybe not so aerodynamic but with the weight divided 2/3 behind 1/3 up front and baggage especially on the front low down it still makes more sense to me rather than having weight attached to the handlebars. I’m happy with my setup and your article saves me buying new stuff to try a other way!!!! Thanks very much it makes great reading too.